Note: If looking to purchase a Tides Marine Shaft Seal, we have the entire catalog for sale, here: Tides Marine Shaft Seals. For more information on the products, see below. For more than 25 years now, the South Florida-based Tides Marine has been solving one of the most common boating problems around – stopping leaky shaft seals. Widely recognized as the industry standard, the low-maintenance Tides Marine shaft seals will keep your bilge as dry as the rest of the boat, and require very little attention, especially compared to traditional stuffing box / packing glands. Even a well-adjusted stuffing box should drip into the bilge at least once per minute. That was okay back in the day when boats were built with deep bilges and tended to leak at the seams anyway – but modern, leak-free boats with shallow bilges are a different story. Nowadays there’s a much wider choice when it comes to stopping the water coming in via the stern tub. Ever since the first propellers / shafts were attached to the first internal combustion engine on a boat, there has been the issue of trying to prevent the inflow of water through the all-important hole in the hull, while simultaneously protecting the shaft from damage caused by friction. For ages now, traditional packing glands / stuffing boxes have served this purpose; the packing kept the ocean out… for the most part… and the small, steady leak worked to keep the packing cool, and prevent the shaft from scoring. But as with all things in the marine industry, a change was due. Enter the dripless shaft system. Tides Marine dripless shaft systems use machine-polished surfaces held together by pressurized tension from a surrounding rubber bellows. 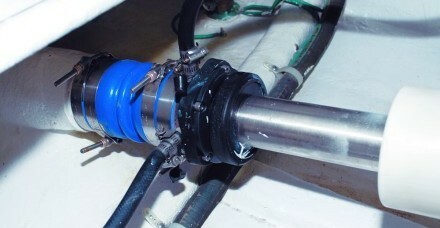 A hose connection between the intake side of the engine’s raw water pump supplies water from the engine to lubricate a rubber lip seal, as opposed to incoming sea water. Thanks to this cleaner and less “needy” design, dripless shaft seals have become the familiar norm in most applications and taken the lead for quite some time now when it comes to sealing shafts. With tons of units sold, Tides Marine shaft seals are used by more US recreational boat builders than any other brand because they’re easy to install and align. Owners and captains love them because they keep the bilge dry and free of corrosion, and require very little attention and maintenance. Made from a strong, fiber-reinforced composite material, the Tides Marine Shaft Seal housing is durable and compact. The material used is not affected by temperature and will not absorb water. The integral PTFE bearing ensures a long operating life of the shaft seal. 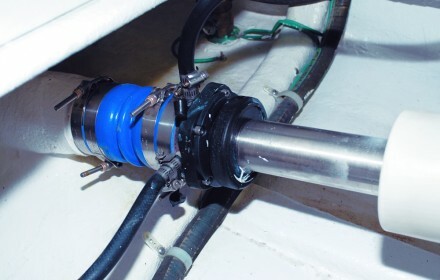 Connecting the shaft seal to the vessel is now easier with a hose that automatically positions the SureSeal the correct operating distance from the stern tube. Measuring is not required and installation is simplified. Lip seal replacement is extremely easy as well, thanks to the removal front cap which improves access. A worn lip seal can be replaced, even while the vessel is in the water, restoring the 100% watertight seal in no time. Tides Marine builds and designs to ABS (American Bureau of Shipping) Standards and is a member of the ABYC (American Boat and Yacht Council). Tides Marine is an ISO (International Standards Organization) certified facility. PSS shaft seals by PYI are face seals, which bear against a contact face – a split ring that bolts around the propeller shaft and rotates with it, just ahead of the seal. A PSS shaft seal depends on the pre-compressed bellows to maintain a slight pressure, assuring just the right degree of contact between the seal and the rotating face. 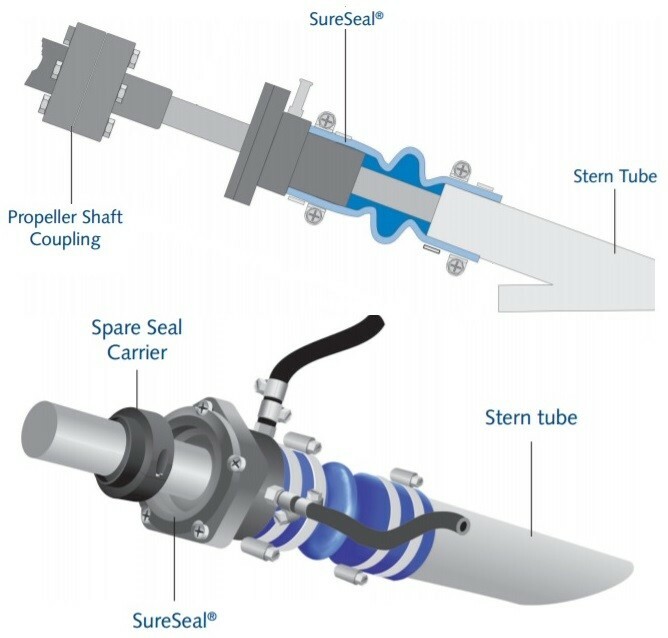 Lip seals, such as Tides Marine’s shaft seals, have no rotating ring. The seal, instead, is directly against the propeller shaft. 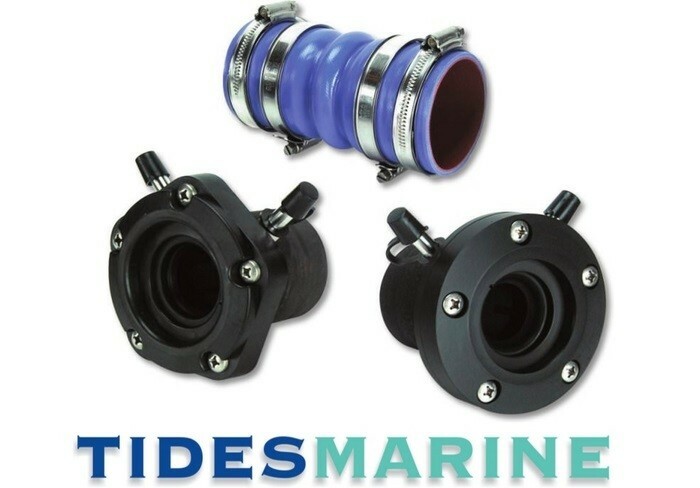 Tides Marine also uses a bellows, similar in appearance to that used for PSS, but it is simply to allow for flexibility, not to maintain seal contact. So, which is the best dripless shaft system? They’re both good, and both used in different scenarios. Tides Marine Shaft Seals require no rotating ring, and in fact, have no moving parts at all, but they depend on a pristine propeller shaft surface to maintain a seal. PSS Shaft Seals require a rotating ring and adjustment of the bellows preload, but because of O-rings within the ring, they can be mounted to less-than-perfect shafts and still maintain a good seal. Advantages that Tides Marine Shaft Seals have are that they do not need to be “burped” like PSS shaft seals, as they are water fed from the engine. They are very easy to fit provided you have sufficient length between the gearbox and stern tube, and there is no need to align it as it is so flexible it self aligns. We are dealers for Tides Marine Shaft Seals, and can get you the shaft seal you need, at the lowest price possible. We carry the entire SureSeal line here: Tides Marine Shaft Seals. Free US shipping. Questions or comments as to the proper shaft seal for your boat? Feel free to chat with us below, or give us a shout, here! Proper installation and maintenance of Tides Marine Shaft Seals is paramount. 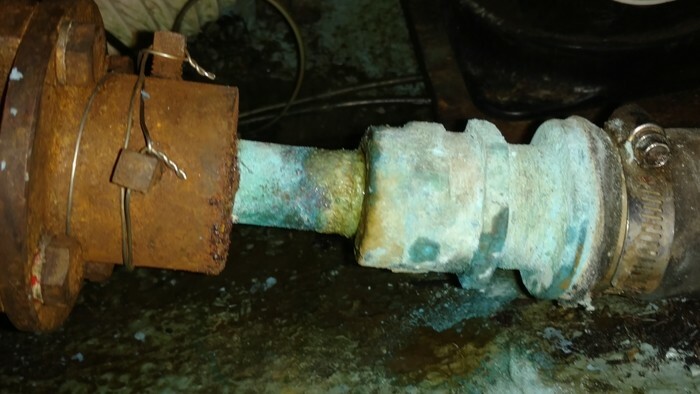 While most boaters use their Tides Marine shaft seals for hundreds of hours, if not decades, without experiencing a single drop of water entering their boat, incorrect installation or neglect can lead to dangerous amounts of water entering your vessel. You need to ensure you have an expert on the job when installing the seal, and that you know what to look out for, and how to at least perform some of the maintenance yourself. Make sure there is never any blockage of the pressurized water feed to the shaft seal, and that the impeller is working well. It is vital to maintain a continual flow of water, and this is an important point that should be added to every maintenance checklist. If not, this can lead to overheating and possible wrecking of the shaft seal. Maintenance includes examining the lubrication system, hoses, clamps, and pump, on an annual basis. When performing maintenance, remove the water lubrication hose from the shaft seal. Make sure the fitting on the seal is clear and inspect for corrosion. If the boat is in the water, there should be a strong inflow of water from the slip into the boat. Use the inspection cap attached to the fitting to stop this inflow. With the vessel in the water, idle each engine. Check the water flow from the lubrication hose at the shaft seal. The flow rate should be about one gallon per minute at idle. Tides Marine recommends changing the lip seals every five or six years. Dirt, grit and fishing line can get sucked up if you run aground or operate in shallow, sandy bottom areas. If you notice a slight leak which steadily increases over time, immediately investigate further and resolve. If something ever hits the running gear, or if there are any alignment or vibration question, make sure you have your shaft seal checked as well. Should the boat need to be towed, the drive shaft should be immobilized or the engines allowed to idle to provide lubrication water for the shaft seals. If a crossover line is fitted on a twin engine boat only one engine need to be idled. Should you have any questions about your particular dripless shaft seal, it’s best to get in touch with the manufacturer and have it serviced. The shaft seal systems on the market today are rather robust and will have a fairly extended longevity with regular and diligent preventive maintenance. Some use a face seal and some a lip seal, but they share the advantages of being virtually leak-free and requiring little or no routine maintenance, explaining their popularity with owners.